You cannot vote twice for a website! Novi Builder is a really powerful drag-and-drop HTML constructor. It is perfect for beginners who plan to launch their own sites, as well as for experienced web developers. Creating a website used to be a long and complicated process. As you are about to see in this Novi Builder review, this isn’t the case anymore. Why is this important? To understand that, we need to look at how things used to work. Initially, sites were created using HTML. As a result, you had to be a specialist in web programming to get the exact website look right. If you wanted your site to be a success, you had no choice but to pay a developer. The assistance wasn’t cheap. Nowadays, though, there are a lot more options. We’re going to have a look at one of them in this review – the Novi website Builder. Why Novi? Because Novi is one of the best website builders out there. It’s so simple that even a newbie with no understanding of coding can build sites. It’s also a great tool for professional developers who want to save some time when creating sites for their clients. 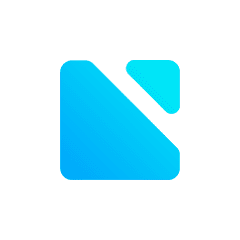 After you’re done with Novi Builder download and installation, you’ll quickly realise that it’s an HTML visual builder that uses a simple drag and drop approach. It consists of pages of generic blocks. All you need to do is to fill in your details. What we really like about this software, though, is that you can import your existing site in HTML format and perform tweaks. It’s an excellent tool for those with B2B or B2C companies and helps you create a stunning and fully functional website quickly and easily. We particularly loved the interface and how simple it is to use it. If you’re interested, you can opt for a basic Novi Builder free download to get an idea of how easily you can use the software. Check out our review, and then see for yourself whether this software can fulfil your web building needs and skills. To put it short, for the most part, it is easy to use and intuitive. However, the initial installation requires you to have an Apache web server. Note that this is not plug-and-play software that runs off a simple download. Your system must meet specifications. To learn exactly how to install Novi Builder, you’ll need to follow the step-by-step instructions on the site. To be honest, this might be a little challenging for a complete newbie. However, the company provides support for queries, so you can get help if you need it. Once everything is installed and up and running, it gets much easier. From there, all you need to do is to go to the Novi Builder login screen and enter your details. There is no steep learning curve here at all. It’s simple enough – you sign up, and then move on to either importing your existing site or creating a new one from scratch. If you want to build a new site, just choose from one of the handy templates that the tool offers and go from there. There is a quick introduction when you’re starting. This intro is all you need to learn how to use the software. If you know something about HTML coding already, you can skip this and try your hand at using the software. You can try out the Novi Builder demo before you buy the software and see for yourself how simple it is to use. We’d advise reading through the intro because the software is ridiculously simple to use. You have a choice of industry-specific designs which should provide you with all the basic pages your site requires. If you want to add a new element, you just hit the “Plus” button in the middle of the screen. You’ll then need to choose which element you want to add. It could be a video, a banner, a carousel of photos, and so on. Just click on any element, and you’ll be able to change the text or the picture as you like. The user interface is clean and clear to use. Each addition goes smoothly without the software freezing up or hanging anywhere. Back in the bad old days, if you wanted to create a site, you’d have to be willing to write pages and pages of code. While this is not a big deal to a seasoned pro, it is a time-consuming project. Also, it’s not that hard to miss a small error in the coding. This is something that you’re not likely to notice until the site goes live and someone tries to use it. Finding the fault means a lot more time being wasted. With this tool, you don’t need the coding, and we are sure you won’t contact Novi Builder support team often. All you do is select the appropriate element from the options and enter your information. Adding a new element is as simple as clicking a button. You can add in your own images simply by clicking on the element that you want to change, then clicking on the “Replace” button, and then choosing your replacement picture. Overall, it’s a straightforward process and will help newbies without any idea of how to code a site. It will also help those who need to create sites for others. Changing an image is simple. You just double-click on it to bring up the editing toolbar. You can then select “Replace Image” and then choose a new one to upload. After you’ve selected the image that you want to use, you can crop it in the software to get the perfect dimensions before adding it. The image editor is very basic – you can crop or resize the image. If you want to do more, you’ll have to edit it in a photo editing software like Photoshop. If you want to update the content on your site, just click on the content that you want to edit. If it’s written, selecting it will enable you to replace it with the new text easily. The editor is pretty basic as well. Whether the content is centred or not. Create your text as usual in a Word document. You can then drag that document in and drop it into the right place on the screen. As you can see, changing content is easy. If you just want to shoot from the hip, you can type content directly on the site. Click on the text that you want to change and start typing. It’s that easy. You can access a lot of different themes. How many depends on which plan you are on. The very basic plan allows you to use one of the themes. The Advanced package gives you access to 20 themes, while the Developer package gives you lifetime access to all templates. You can also develop your own theme for personal use or to sell it. You can contact Novi to list you as a developer on their site. The themes on offer are well-designed and look professional. They are easy on the eyes and look clean and uncluttered. Overall, the design features are what have impressed us most during our Novi Builder review. Start-up, and a lot more besides. Just like with most services out there, you have to pay per template that you use. With Novi, the number of templates you’re allowed to use depends on your membership plan. As an advanced or developer member, you are entitled to access all the themes. The primary difference between these to options, though, is that the developer option is a once-off fee, whereas the advanced user option is billed annually. Novi Builder templates have been professionally designed and are highly responsive across a range of different devices. Yes, the site will be optimised for mobile devices. That said, we’d advise that you use a mobile-first approach when designing the site. That means ensuring that the font is readable on a small screen, that pictures display properly, and not using more than one column of text. Internet connection speed of at least 1 Mbit. You could insert a link to your blog on your website by editing any content on it. The software could also be used to help create a new blog. There is no feature that allows you to add your blog content as a page on your site, though. SSL encryption is fully supported. The company’s software is only for creating and maintaining your site. It doesn’t offer hosting at this stage, so there is no option to buy a domain name or have a company email running through Novi. All you need to do is select the type of form you want to add using the preset options. You can customise certain aspects of the form once you’ve put this into place. The site offers easy to use contact and subscription forms. Everything is clearly marked on site. You can also access the menu by either right-clicking the area that you are working on or accessing the toolbar shortcuts above each area. This makes it a lot easier to move between screens and elements on the page. The company works with a range of different plugins to build functionality on your site. There are more than 20 plugins to choose from. The software allows for integration with MailChimp, Google Maps, and a good few others besides. You can also integrate live feeds from the main social media sites like Facebook, Instagram, and Twitter. The builder doesn’t have a built-in shopping cart, but that is easy enough to add if you use the plugin supplied by the company who’ll be managing the payments for you. You can use the HTML templates provided to make as many sites as you like. This is something that is a big bonus for developers. You can opt for the once-off payment which gives you a license to use the existing and future templates. You are allowed to use the templates as they are. You are not obliged to change elements of the templates that you are happy to keep. You may also design and sell sites that you’ve created using the software. This is what makes your life easier. You select the elements that you want to change, lodge those changes, and the builder will create the necessary code accordingly. It’s quick, it’s simple, and the software is easy to use. If you need to build great-looking sites in as short a time as possible, this is an excellent option. It’s a great deal if you aim to become a web entrepreneur. Of all the Novi Builder features, this is the one that is, by itself, worth the cost of signing up. You can set up your site under any of the three packages. For the two more basic packages, you pay for a year at a time. During that time, if there are updates to existing templates or new ones are added, you’ll be able to access them. With the Developer package, you pay the upfront fee and then nothing thereafter for as long as the company is running. Images make a site look good, but also increase the file size substantially. You must ensure that all images you are using have been compressed and optimised for web use. Videos can also be bulky. That’s why it’s better to link them through a third-party service instead of hosting them on your site. Every extra element that you add means that there is another element to load. That’s why it is essential to ensure that you pare down your options. The best-looking site in the world won’t do you any good if it takes forever to load. Not many visitors will hang around to wait. How SEO-Friendly are Novi-Based Websites? The site created with this tool can be easily optimised for SEO purposes. You do not have the option to change the URL structure, but you can edit meta description and submit a site map if you like. Novi provides you with the website builder only. You’ll need to install something like Google Analytics if you want to monitor the performance of your site. Startup: This comes at $29 per annum. You are allowed to use the company’s multi-purpose template but none of the others. This is the perfect option if you want just to set up your own website quickly and easily. Advanced: This will cost you $49 per annum. You may use all the templates on the site and receive updates for as long as you are a member. This is a good option if you have a few different sites to set up. Developers: This is the premium option and comes at the cost of $149. The advantage of this plan is that you get lifetime access to the current templates and any new additions. You may use as many of them as you like. If you’re in the business of creating sites for others, this is the most cost-effective option. None of the plans includes hosting or a domain name. That’s something you’ll have to get externally. This might seem like a bit of an inconvenience, but it’s actually pretty clever move by the company. It is concentrating on what it’s good at – building sites. Adding extra services over and above this dilutes its service offering. 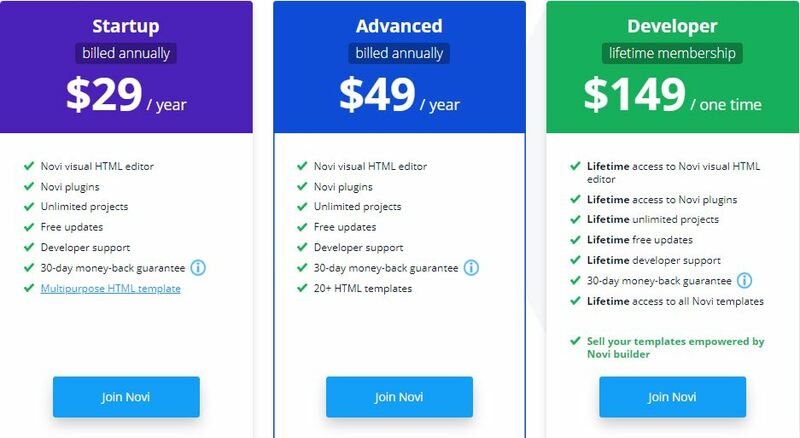 It offers services to help you build the sites and import everything, but these start at $49 per page. The multipage and plugin offer costs $249. You do not have to avail of these services, but it is nice to know that you have the option to do so. When we compare Novi Builder vs competition, we must give credit to the company. There are no hidden costs to worry about here. The company is very forthright about the pricing. It doesn’t have a lot of different pricing packages that could be confusing, and it doesn’t hook you with a low price only to make you pay for templates that you must have at a later stage. You’ll select the plan that you want to subscribe to. Your options are one annual billing or to pay the once off fee for lifetime membership. There are no month-to-month billing options available. These are limited to PayPal and credit cards. If you opt to pay through PayPal, you’ll need to authorise a pre-approved payment for the next year as well. The company runs a forum for the community and has a Facebook page as well. You can access the Facebook page by clicking on the Community section under the Support tab. If you still cannot find what you’re looking for, you can lodge a query through the site. According to the site, you get support 24/7, but we didn’t feel that this was accurate. There is no help desk that you can phone and no instant chat. If you get another message, “Novi – HTML page builder & visual content editor nulled,” and you need to contact the company for assistance, you can submit a ticket or complete the contact form. To submit a ticket, you have first to prove that you’ve bought the product. This can be done through Envato or by inputting your purchase code. It is a bit of a schlep, to be honest, and something that the company does need to look into. It takes an average of about a day or so to answer queries. Support is free to all clients as long as their subscriptions are current. The company does have a pretty substantial support section, so you might find the answers you need without having to contact staff. This can be found in the Novi Builder Documentation section of the Support tab. While we’re impressed with this software overall, we believe that there should be an easier way to get the needed support. It’s also a little annoying that there is no helpline or instant chat option. This could be a problem because you might be working on a new site and just have a quick query that could be resolved in a few seconds. Is this the perfect site builder? Should you consider it for your own site? Our verdict is that there is still some work to do when it comes to complete newbies. It’s not the actual use of the software that is an issue here, but rather getting it installed in the first place. Once that’s been done, though, it’s pretty much plain sailing. Here, it would be nice if consumers were able to get some assistance to walk them through the installation process. We did feel that we had to mark the company down in terms of the support options. To be fair, though, this Novi Builder review finds it to be only a minor issue. The software itself is basic, but with all the available options, there is no real need for powerful editing software anyway. The software works flawlessly and is everything that you need to create a fantastic website. Our final verdict for this review is that this software is amazing for the price that you are paying. The lifetime membership option is not something that most companies offer, and it can save you a lot of money overall. Having to pay for a year upfront does make a recurring subscription seem more expensive. If, however, you compare the cost of Novi Builder with other similar services out there, and factor in that most other companies charge you per template you use, it is a reasonable price. All in all, this is a good deal – you get software that works seamlessly for a reasonable cost. We hope that this Novi Builder review has proved useful to you. Let us know in the comments below. © 2018 websitebuilder.org.uk - All rights reserved.